^ ジョンソン & ロビンソン 2014. ^ a b c d 村中文人 2000, p. 516. ^ a b c d e f g h i j k l MacNeil 2001, pp. 848-857. ^ 森枝卓士 2004, p. 70. ^ a b c d e f g h Domine 2008, pp. 840-844. ^ a b c d e f g h i j k l m n o p q r s t u v w x y z aa Johnson 2006, pp. 29-33. ^ Johnson 1989, p. 434. ^ a b c d e f Johnson & Robinson 2005, pp. 300-301. ^ a b c Catena 2010. ^ a b Rolland 2006. ^ Tim Atkin: Uco Valley , "Tim Atkin: Uco Valley "
^ Stevenson 2005, p. 545. Johnson, Hugh (1989). Vintage: The Story of Wine. Simon and Schuster. ISBN 0-671-68702-6. Johnson, Hugh; Robinson, Jancis (2005). The World Atlas of Wine (6 ed.). Mitchell Beazley Publishing. ISBN 1-84000-332-4. MacNeil, Karen (2001). The Wine Bible. Workman Publishing. ISBN 1-56305-434-5. Robinson, Jancis (2006). The Oxford Companion to Wine (3 ed.). Oxford University Press. ISBN 0-19-860990-6. Domine, Andre (2008). Wine. Ullmann Publishing. ISBN 978-3-8331-4611-4. Stevenson, Tom (2005). The Sotheby's Wine Encyclopedia. Dorling Kindersley. ISBN 0-7566-1324-8. Catena, Laura (2010). Vino Argentino, An Insiders Guide to the Wines and Wine Country of Argentina. Chronicle Books. ISBN 978-0-8118-7330-7. Rolland, Michel (2006). 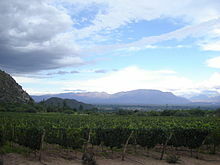 Wines of Argentina. Mirroll. ISBN 978-987-20926-3-4.